Despite being absolute Weeaboo trash, I haven’t seen the entirety of SAO from front to back. I’ve seen a few episodes and I know the general idea of the story arcs, so I kinda know what’s going on with this series. Also apparently a lot of people really hate it? I'm guessing that's anime hipster nonsense due to it becoming quite popular despite similar themed anime series at the same time not doing as well. 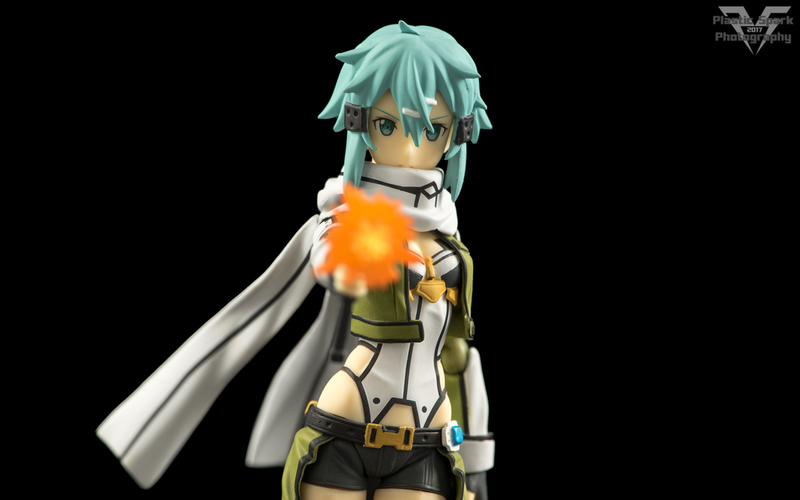 That's really not what we are here to talk about, let's get into the review for Figma Sinon! 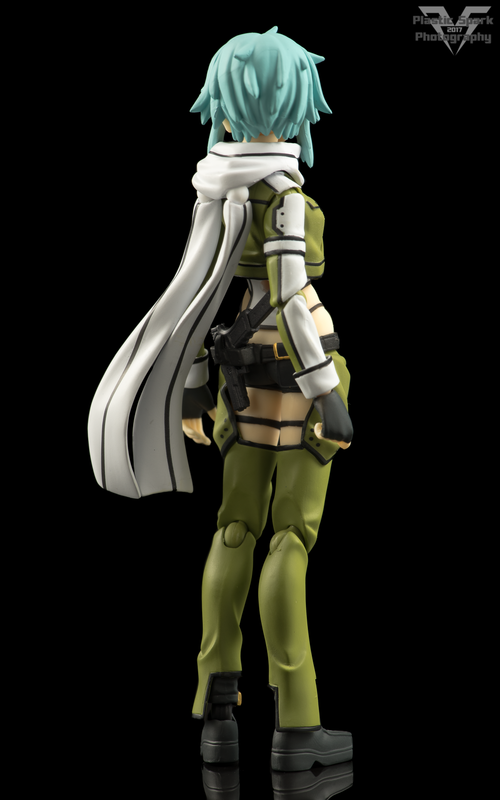 I absolutely adore the design for Sinon. Her colour palette, cute design, and general “AniM3 gurrl wit GUN” aesthetic made me a fan from the first time I saw her. (( I’m both predictable, and pathetic. What a combo! )) Even without being a big fan of the source material this was a Figma that I absolutely had to add to my collection and thanks to a recent reissue I was able to achieve that goal at a relatively modest price to boot! Sinon is a fun Figma to pose, with a ton of articulation and very little in the way of limitations. Her outfit is clean and well executed with a soft rubbery plastic used for her jacket, as well as the fabric on her upper thighs. This allows for a ton of movement without breaking the illusion of the outfit. I was even able to get her to sit relatively flat so you really don’t need to worry about those thigh pieces causing any real issues. Her scarf is adjustable with Figma joints at the base of each tail, this is really useful for adding motion to otherwise static looking poses. The scarf can also be removed if you want a cleaner look. I think it would have been cool if the jacket was removable as well, with replacement arms to complete the look but since this was very rarely shown in the series I understand skipping it. (( Despite this I still tried to take her jacket off because I’m a shameless pervert but I ended up giving up the quest as I was afraid that I might damage my new waifu… did I just type waifu ironically or intentionally? This is getting out of hand someone please kill me. )) . Every bit of detail has been incredibly well applied with very clean and crisp paintwork, some of the best I’ve seen on Figma to be honest. I think it helps that she has a fairly basic colour scheme and none of the harder to paint colours like yellow or red are present. Sinon’s accessory loadout is pretty impressive. She comes with her trademark ‘Hecate II’ Sniper rifle of course, with option pieces for an extended bipod, as well as a replacement stock with the monopod extended. The rifle can be a bit tricky to hold, as there is very little clearance in the grip area. Just be patient when manoeuvring the rifle into her hands. I would recommend attaching the hand to the grip of the rifle on its own, and then plugging in the hand to the arm with the gun already mounted. The rifle also has a strap to help Sinon carry it on her back. The strap is made of a sort of rubbery material and can be removed and remounted on pegs located on the stock and the side of the rifle. Sinon also includes a pistol with a non-removable extended magazine, this can be held in either hand utilizing her many replacement hands, or held in a holster mounted on her lower back. I really love that they gave her functional storage for this sidearm, and that her articulation allows her to actually reach and draw the pistol from its storage. There is also an included muzzle flare that can press onto the front of the pistol, nothing too special but a welcome inclusion. I would have liked to see a similar effect included for her rifle. As with most Figma products, Sinon has a plethora of interchangeable hands and faces. She comes with 10 total hands including a pair of clenched fists, holding hands, trigger finger hands, and splayed hands, as well as a single relaxed/supporting hand for her left, and a pointing finger for her right. She comes with a replacement head piece with an extended neck peg, to allow for sniper poses while laying on the ground, as well as 3 total face plates; her default emotionless stare, with her eyes looking directly ahead, a shy smile looking to the right, and a grimacing combat face that is looking to her left. The faces are all really well sculpted and the detail work in the eyes is nothing short of phenomenal. This is an area that I almost always feel Figma excels in and Sinon is no different. Sinon’s eyes are absolutely stunning. Figma Sinon is a fantastic figure. If her aesthetics appeal to you, If you like gunslinger anime babes, or if Sword Art Online is your jam, then this is the Figma for you! I really don’t have any negatives to mention about this figure. Sure the jacket could be removable since she seems to have a fully sculpted and painted outfit underneath but that’s not typical of Figma to begin with and I’m really just digging myself into a deeper hole here aren’t I? I swear I’m not that much of a cringe worthy social outcast! (( Yeah that’s right… if you type it on the internet then it must be true. )) Her accessories are on topic and well executed, and the figure itself is a fair price if you aren’t paying aftermarket inflation. I’m very happy with my new addition. Now I just need to get to work putting together my Little Armory weapons so she can have MOAR GUNZ!